It is nearly the start of another new year, but this year there will be an extra pip just before midnight. The pips (heard often on BBC Radio Four) mark the five seconds leading up to the hour with the final, longer, pip marking the start of the new hour. This year there will be seven pips instead of the normal six because we have to add a leap second in order to keep Coordinated Universal Time (UTC) in line with time measured by the Sun. The reason we have leap seconds in the first place is due to the very gradual slowing down of the Earth's rotation over time. The second is defined as "the duration of 9,192,631,770 periods of the radiation corresponding to the transition between the two hyperfine levels of the ground state of the cesium 133 atom" (USNO) and is measured by a collection of caesium clocks around the world. Earlier in 2005 the suggestion that these leap seconds should be abolished caused quite a debate. Why should anyone care? It's just one second, after all. It matters for radio astronomy. In order for interferometry to work correctly astronomers need to know very accurately where their telescopes are and the exact time at which each measurement was made so that the signals can be combined later. If time is measured differently at different telescopes then it all goes horribly wrong, we lose vital information and can no longer make a map of the sky (which is the whole point). You might still be thinking "so what?" Well, it matters for satellites too. One of the arguments for abolishing leap seconds is the difficulty that systems such as the GPS satellite network have in incorpating the changes into their systems. Many systems like this require the changes to be added in by hand rather than automatically. The proposals are still being discussed and the debate is ongoing, but I will be listening at midnight. Right now I'm off to listen to Jool's Hootenanny.... Happy New Year. The weather over the last two nights has been truly fantastic. The skies have been superb and I've actually had the camera out on the tripod. Normally I might try the odd picture with the digital camera, but this was worth getting out the SLR for. The telescope controllers are really useful people to know sometimes - when I've run star parties they are always happy to turn off the flood lights which normally illuminate the telescope throughout the night (the floods are not there to cause light pollution and annoy the locals, as some people seem to think, the telescope is a very large, very heavy and very expensive scientific instrument, if something goes wrong, the controllers need to see what is happening), so I surprised them on the last two nights when I asked them to turn on a few lights. I wanted to try the shot from a few weeks ago with a proper camera and a few extra lights on the structure shows it up quite nicely from a distance. Don't worry, they were turned off again about an hour later (as soon as I'd gone numb and decided to call it a night!). Last night the temperature reached a chilly 19.4 degrees Fahrenheit, about -7 degrees Celsius, and today has been fairly chilly too so that a lot of the ice that formed last night is still there. And now it is snowing outside my window too! All of the above images were taken with a small digital camera (a Nikon Coolpix 2100) with minor postprocessing in the Gimp. The one that needed the most work was the image of Perseus and Cassiopeia which is a sum of several frames. This is done to artificially create a long exposure as the camera is not designed for that sort of thing! Click on them to see larger versions. The Chandra satellite normally observes the distant Universe using X-rays (which have far higher energies than the radio waves with which I normally observe galaxies) but scientists using the telescope recently turned it to point at our own planet. They observed the Earth ten times between December 2003 and April 2004 using the High Resolution Camera (HRC) which, if your eye had the same resolution, would let you read a newspapaer at a distance of half a mile! The images below, released yesterday, show what Chandra saw. The bright arcs seen in the observations are regions of X-ray emission generated by auroral activity which we see as the northern or southern lights. Aurora are the result of the interaction of charged particles in the solar wind with the magnetic field and atmosphere of the Earth. The charged particles streaming away from the surface of the Sun are affected by the Earth's magnetic field, causing them to be "channeled" to certain areas of the Earth's atmosphere where they crash into particles in the air emitting the erie light that we see, and the X-rays detected by Chandra. This is not the first time that X-rays have been detected from aurora, the Polar spacecraft also observed this phenomenon, but the X-rays seen by Chandra are at much lower enegies making these observations unique. 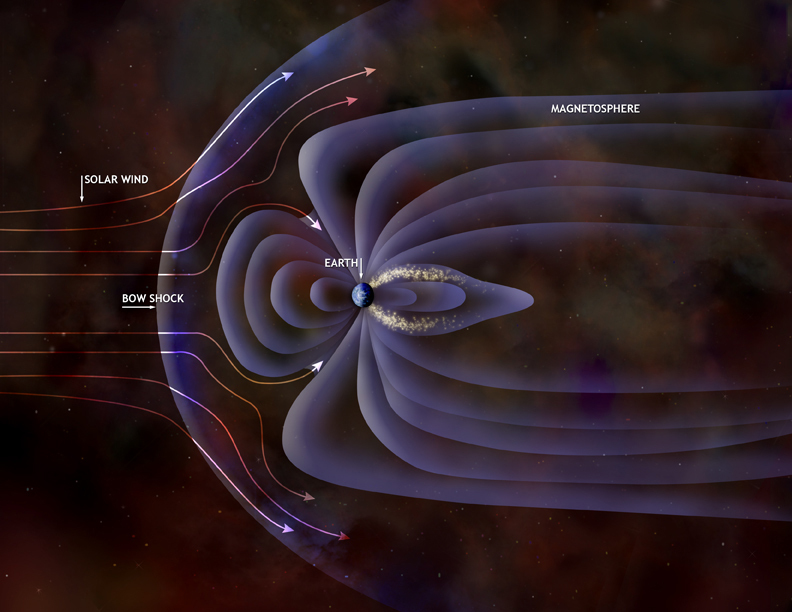 The press release contains a nice image illustrating the interaction between the solar wind and Earth's magnetic field, how aurora work, and the above pictures in higher resolution. I haven't posted much recently for various reasons, but a lot has happened: another weather satellite has been launched, New Horizons is looking good for launch to Pluto in January, NASA have started a podcast, Hubble spotted new rings and moons around Saturn, science triumphed over intelligent design, Hayabusa has had both sucesses and problems, Colin Pillinger and his team think they may have found the remains of Beagle 2, and Stardust is nearly home. I've spent this afternoon scanning in some old glass slides that I found over in the archives a while ago. They show the early days of the Observatory when the Lovell telescope (then known as the Mark I) was still in construction and most of the other telescopes on site were collossal wire constructions that barely resemble the telescopes of today. On the left is one of my favorites showing the complexity of the scaffolding used in building the Mark I (click on it for a larger version). While looking for some stars that can be used to calibrate the brightness of supernovae in nearby galaxies (part of a new project for schools to use with the Faulkes telescopes, more on this another day), I came across two websites: astrometry.org and astrophysical.org which are full of useful information. The Moon spins on its axis once a month (compared to 24 hours for the Earth) so both sunset and sunrise last a very long time. The line dividing day from night on any planet or moon is known as the "terminator" and on the Moon this line moves very slowly. (In fact, in an episode of Futurama, Fry and Leela are stuck out on the lunar surface and try to out run the terminator, can you work out if that is possible?) Despite the fact that the Moon is too small to hold on to an atmosphere, there may still be weather on our nearest neighbour. Recently, NASA reported that there may be a dust storm which runs along the entire length of the lunar terminator from the North pole down to the South. The evidence for this comes from an experiment left on the Moon by the astronauts of Apollo 17 back in 1972. The lunar surface has been pummeled by meteorites over billions of years, breaking up the surface material and producing vast amounts of dust. The Lunar Ejecta and Meteorites (LEAM) experiment was designed "to look for dust kicked up by small meteoroids hitting the moon's surface" according to Timothy Stubbs at the Goddard Space Flight Centre. The LEAM experiment was designed to investigate how much dust is stirred up by impacts (which still occur now, just less frequently than they did in the early days of the solar system). The detectors only operated for 620 hours of lunar darkness and 150 hours of lunar daytime, so data are limited, but scientists are now busy re-analysing it to look for evidence of this dust storm. According to Gary Olhoeft, professor of geophysics at the Colorado School of Mines, what the data show is more particles coming from the east or west than any other direction, moving with slower speeds than would be expected if the dust had been stirred up by an impact. The current theory is that the day side has an overall positive charge while the night side has a net negative charge and the resulting electric field causes any dust which also has a slight electric charge to jump across the dividing line. This charged dust could also explain the lunar fountains sketched by the Apollo 17 astronauts which are similar to crepuscular rays caused by the atmosphere on the Earth. Not a phrase that appears very often in scientific papers, but it does appear in this paper by Max Tegmark and Nick Bostrom based on a short article published in Nature in which the authors ask "How unlikely is a doomsday catastrophe?". There are many ways to destroy the human race, but getting rid of the entire planet Earth takes a bit more effort. Still, there are some ways it could be done, some of which are mentioned in this article. The threat from asteroids has been known about for a long time and (despite the odd scare story) nothing that is an imminent threat has been found. This doesn't mean there aren't any asteroids that will wipe us out any time soon, just that we haven't found them yet. There's a lot of stuff up there and very few telescopes looking for them. There is also climate change, a topic that is also in the media a lot just now. Like a collision with an asteroid, this would just wipe out life on the planet rather than destroying the planet itself. Some species may survive even a major climate alteration but the Earth would be very different to how we know it today. There is still debate over whether mankind is to blame for the changes we see in the climate. No doubt we are having some effect, but we know Earth's climate changes over time anyway. How much of it is due to us, and can we do anything about it, assuming we can get everyone to agree. There are ways that humans could destroy their own planet as well. When the Relativistic Heavy Ion Collider (RHIC), a particle accelerator used to smash particles together at the Brookhaven National Laboratory, first began operations there were reports in the media that the collisions could create black holes that would destroy the Earth and possibly the entire observable universe! Back in March there were reports that they had created a black hole, but what they actually created was a singularity, mathematically similar but without the capability to accrete matter and devour the Earth. What Max Tegmark and Nick Bostom have done is calculate an unbiased estimate for the frequency of doomsday scenarios, those involving things outside the control of the human race such as a nearby supernova, a black hole created naturally, or invasion by a race of hostile robots. You might assume that since life on this planet has lasted so long the time between such events would be large. This would be biased though, because we have to be here to make the observation, a version of the good old anthropic principle. They point out that the frequency of these events may really be quite high, and that we have just been very lucky up until now. They conclude that the probability of a catastrophic event caused by an external event is one every billion years, and that the yearly risk from man-made accelerators is about one in a thousand billion. Very reassuring. Last night was the December workshop of Macc Astro, it also happened to be a very clear night. After most of the members had gone, out came a telescope and a couple of us spent an hour or so looking at various objects. Mars was very impressive high in the South and the double cluster (NGC884/869) in Perseus provided an interesting challenge (polar mounts are not very good at pointing at the zenith!). As I was leaving the site at midnight I decided to test out the capabilities of my little digital camera. I left my bike by a tree and wandered across a field so that Orion was positioned above the telescope. Unfortunately I didn't have a tripod with me either, so the camera was balanced on my rucksack on the ground. A lot of the shots didn't work as the camera was pointing to one side or it slipped and the image is blurred. One shot did come out quite well and you can see it on the left. The contrast has been adjusted slightly to bring out the stars but nothing else has been done to the image (click on it for a larger version). Not bad for a two megapixel camera with no proper exposure control! Earlier this week it snowed across most of the UK. On Monday we had quite a bit of snow at the Observatory so some of the students went outside and caused trouble by having a rather loud snowball fight. We built a snowman too which you can see above. Even though most of the snow has now melted, the remains of the snowman are still there, lying in a little heap.